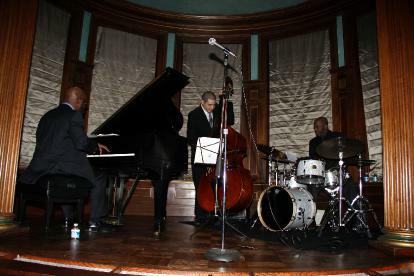 The Grammy-nominated Orrin Evans Trio performed the first of the Ertegün Jazz Concerts at the residence on March 1, to mark the end of "African American History Month." The concert, which drew great interest from American jazz lovers, also brought together top officials. In addition to John Conyers, the founding member of the Congressional Black Caucus, 11 other congress members including Danny Davis, Hank Johnson, Eddie Bernice Johnson, Gregory Meeks, Donald Payne, Edolphus Towns, Mel Watt, Frederica Wilson, Ted Deutch and Sheila Lee Jackson were among the guests of the concert. Other guests included Ahmet Ertegün’s widow Mika Ertegün, Coca Cola CEO Muhtar Kent and Turkey’s Consul General in New York Mehmet Sansar. The United States marks February as the African American History Month. The concert took place with Jazz at Lincoln Center's cooperation and Boeing's sponsorship. “Other concerts will be on April 12, June 6, July 26, Oct. 4 and Dec. 6," Turkey's Ambassador to the United States Namık Tan said during the concert. Conyers, Jazz at Lincoln Center Executive Director Adrian Ellis and Boeing Senior Vice President of Government Operations Tim Keating delivered speeches during the event. Ertegün listened to jazz concerts at the Howard Theater, where black musicians were performing, but also turned his residence into a jazz concert place together with his sons, who later established Atlantic Records. The Ertegün brothers organized a concert featuring white and black people in 1940 for the first time in Washington. A southern senator was furious at Ambassador Ertegün and sent him a letter in which he asked Ertegün whether it was a weird thing for him to admit black people to his residence even though every one knew how they should be treated. The senator wrote, "Everybody knows the way to treat blacks, but you keep allowing them in through your front door. Don't you think this is a little bizarre?" Ertegün surprised the senator with his response, saying, "Yes we always take in our friends through the front door. If you like, you are welcome too, but we will take you in through the back door." The current ambassador, Tan, recalled this story which was a significant sign that Turkey is not carrying out any racism and embracing all people and reminds it to the people of Washington with the concerts he is hosting.